Many pests overwinter in the fall and winter months, including ground beetles, Asian lady beetles, stink bugs, cluster flies, carpenter ants, subterranean termites, spiders, moths and springtails. These pests will move inside your property to seek relief from the cold, but it will seem like they aren’t around because most pest activity completely stops until the weather warms back up. That’s why it’s important to prepare your property before their spring invasion begins. Replace worn-out window seals and weather stripping. Clean window wells and sills of mold or fungal growth that resulted from condensation. Replace door sweeps and weather stripping. Over the course of the year, these devices get worn down, creating gaps that crawling pests can use to get inside. Remind staff not to keep doors propped open, even when the weather is nice. This creates a welcome invitation for pests to come inside. Seal cracks and gaps around the building exterior, including gaps around utilities. Clean gutters and remove debris. This buildup will cause standing water to pool when it rains. Eliminate fallen tree branches and vegetation debris that was ferried in by snow melt, rain or wind storms. Trim tree branches and other vegetation so that nothing touches the side of the building. Install a gravel barrier between the side of the building and any landscaping. The barrier should be at least one metre to help deter pests from crawling indoors. Avoid planting vegetation that produces nuts, fruit, seeds or fragrant odours. Take precaution when mulching flower beds around your facility. Remember not to overapply as this attracts pests. Make sure all trash cans have tight-fitting lids. Thoroughly clean garbage and compacter rooms. The organic buildup can attract pests looking for their next meal. Install an odour neutralizing program in compactor rooms so the air stays fresh throughout the warmer months and is less attractive to pests. Make sure outdoor garbage receptacles are not placed near the entrance and exit doors. Remove any clutter around the property like unused equipment or piles of discarded cardboard. This clutter can provide pest harbourage. Give the property a deep clean. If any pests died over the winter, you need to clean them up. A thorough cleaning that includes often overlooked nooks and crannies will help remove dirt and grime that attracts hungry pests. Check the property for any leaks and make repairs as needed. Check for potential bird roosting and nesting sites. Prevention is the best strategy for managing pest activity, so following these proactive steps will help you stay ahead of potential pest problems – and stop them before they occur. 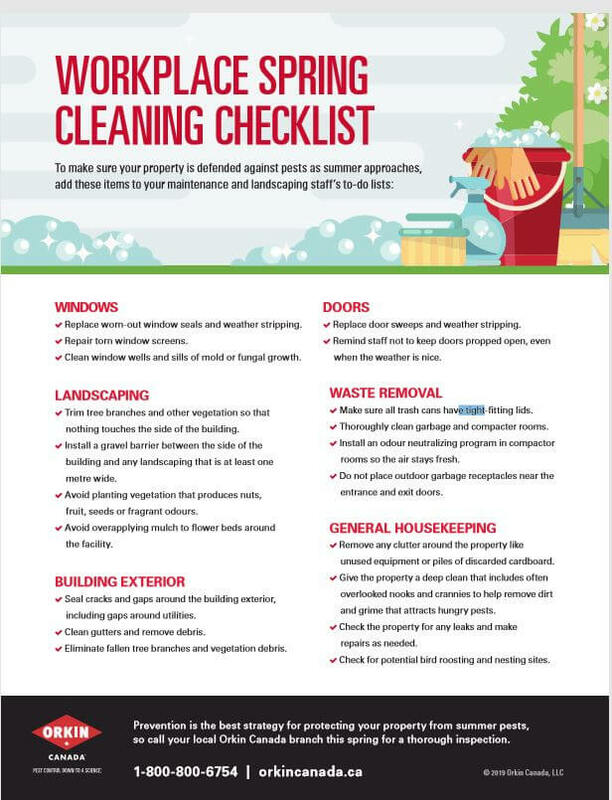 For quick, easy steps that your staff can follow, download our Spring Cleaning Checklist for Commercial Properties.